I am inquring if it is possible to have a 3 step form where the steps correlate with each other? I am developing a online printing site, where customers chose thier product (business cards, flyers, yard signs..ect), pay with credit card (I am signing up a mechant account with Autherize.net), then upload thier files for me to print. I would like to have it where whatever the customers selects in the option menu's on step 1, like 500 business cards for example, I can display the price total of 500 biz cards on step 2, when the customer pays. 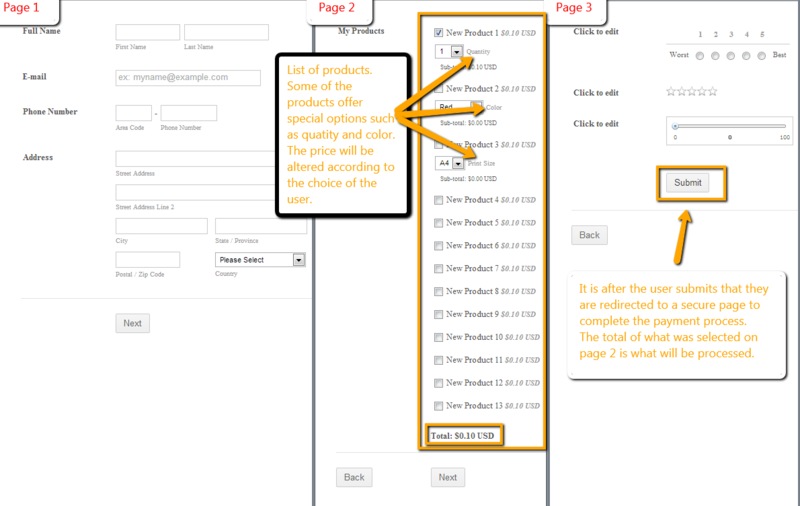 Is there some type of option of "when the customer selects THIS option" on step 1, Step 2 will display THIS".. I seen a templete in your colection that almost achieves this, but it dosen't have payment info in it and dosen't communicate between then step slike how I am inquiring. Currently, our payment tools will process the whole selection process in one step. So if I was to explain the way that paypal worked, there would be a list of available items for the user to choose. Once the user choose, the total would be displayed at the bottom of the list. The user can continue with other sections of the form where information (that does not alter the price of the items) is collected. Once the form is completed, the user is transfered to Paypals secure gateway to complete the payment of what was chosen. When this payment is completed, they receive the"Thank You" msg and any notificaitons that were set on the form are delivered. Please give that a try and let me know if it helped or if you have any otehr questions. Your example is pretty close to what I mean. Wow, Your page 2 nails it! The current question Im left with is there a way for me to implement Autherize.net instead of Paypal? With the price total from Page 2 submited to page 3? From my understanding a Autherize.net gateway will process the card while keeping the customer on the form. Or do I have to have product options and payment processing on the same page? You can extract/split the payment field (items/products in page 2, then, total in page 3), if you will use the form's source code because you can then modify the html source of the form. But this is not highly recommended as it will require more knowledge in modfiying the html codes. The current question Im left with is there a way for me to implement Autherize.net instead of Paypal? Yes, you can change the paypal to authorize.net. It will still retain all your products. Yes, This helps alot. I understand what I can do now in the layout and the structure of my payment form. Thanks to you and Eduardo for your help!